Areta Thomas made the covenant of the People of Praise in September of 2008 at the age of 82! She wanted to belong to the People of Praise because it was Christ-centered and she wanted to live in Christ. She passed away to continue eternal life with Christ on January 16, 2010. 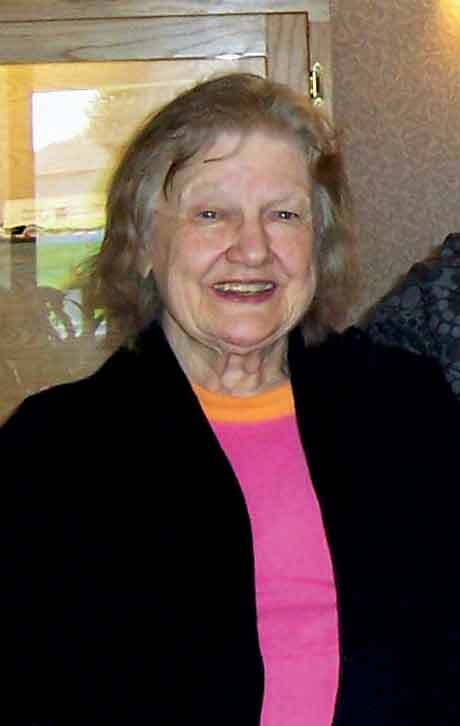 Near the end of her life, she lived with her daughter and son-in-law, Fran and Marty Willard (Servant Branch) and their six children, where she had many opportunities to use her gift of hospitality. Her beautiful smile and the delight in her voice made each visitor feel welcome and loved. The Willard house was a gathering place for many of the children in the neighborhood, and Areta was “Yiayia”—the Greek name for Grandma—to all of them. For several years, Areta’s women’s group met every Monday at four p.m. around Areta’s dining room table. Of course, four p.m. was always prime time for children to be knocking at the Willard door. So the women’s group sat together sharing, praying, laughing, crying and drinking tea, while the doorbell rang and young children walked, and at times ran, through the kitchen. It wasn't unusual for Areta’s women’s group to join hands and bow heads in prayer at one end of the table while a couple of seven-year-old girls sat at the other end of the table quietly eating a snack. Areta Liacakes was born in Dearborn, Michigan, July 27, 1926. She was the oldest of five children and was of Greek heritage. She was raised in the Greek Orthodox Church, and this enriched her life and love of the Lord in many ways throughout her life. She deeply loved and respected her Orthodox tradition. A favorite thing for her to say was, “Christos Anesti!”—which is Greek for “Christ is risen!” Dearborn had a large, active Greek community and the neighborhoods and businesses reflected their life together. As a young woman, Areta worked in the family restaurant in Dearborn, called the Dearborn Family Restaurant. Henry Ford often came in to eat the apple pie. Her daughter, Fran, said that her mom made all her own clothes and hats. She would go to the fine department stores with paper and pencil and sketch the clothes she liked, and then make them herself at home without a pattern. After she was married, Areta was also a working mom. She worked as a pharmacy technician and also had a weekend business with her husband making and selling pizzas for customers to take home and bake. She went back to school in her 50s to become a legal secretary and then operated and owned her own secretarial service for the next 20 years. She often spoke of the value of a higher education and encouraged others to be fearless in their pursuit of that. Areta was married for 52 years to Louis Thomas, also of Greek heritage. They met on an arranged date in September, 1949. Areta’s Uncle Bill knew Lou’s father, and they came up with a plan to have them meet. The plan was for Uncle Bill and his wife to take Areta to dinner at a supper club. Lou’s dad then called him at college and said, “Come home on the bus and bring your best pants—today!” Lou complied and came home. Lou and his parents went to the supper club where Uncle Bill and his wife and Areta were waiting. Lou was introduced to Areta. After dinner, the two married couples stood up abruptly and said, “We’re leaving!” Lou’s dad threw a set of car keys on the table and the four matchmakers left—only to hide behind some pillars to watch what would happen. Areta told that story with a laugh every time! Lou and Areta were married 10 months later. They raised five children together. Lou’s mother would live with them for 20 years; they would add 16 grandchildren to the family, share the joy of living in beautiful Lake City, Minnesota, and travel together to France, Budapest, London, Alaska and Hawaii. They would also experience the loss of their son Bill to cancer in April, 2002. Areta’s beloved Lou died in November, 2002. She experienced deep grief when she lost son, husband, brother, grandson and daughter-in-law within a few short years, but she held on to the Lord, asking him to give her strength. She moved to a nursing home in 2009 and saw that as an opportunity to be able to spend more time with her son and his family, who lived nearby. She reached out to others at the nursing home and brought comfort to the woman she shared a room with. Areta had always loved having her grandchildren around her, and her death brought them all together one more time. Areta was a woman of prayer. She prayed for many brothers and sisters in the People of Praise and she prayed for those who did not know the Lord, because she had a great concern for humanity, for all the people of the world. She often talked and prayed about current events taking place in the world. Her service was intercession, and as her health declined she interceded even more. Areta is remembered for her great love, for her faithfulness to the Lord in difficult times and for her concern for others. She was loved by many. Just ask the children! They know. Thank you for sharing this wonderful story. I feel like it introduced me to a sister I hadn't met yet,and I am filled with joy and thanks to have such a sister.Christos Anesti!